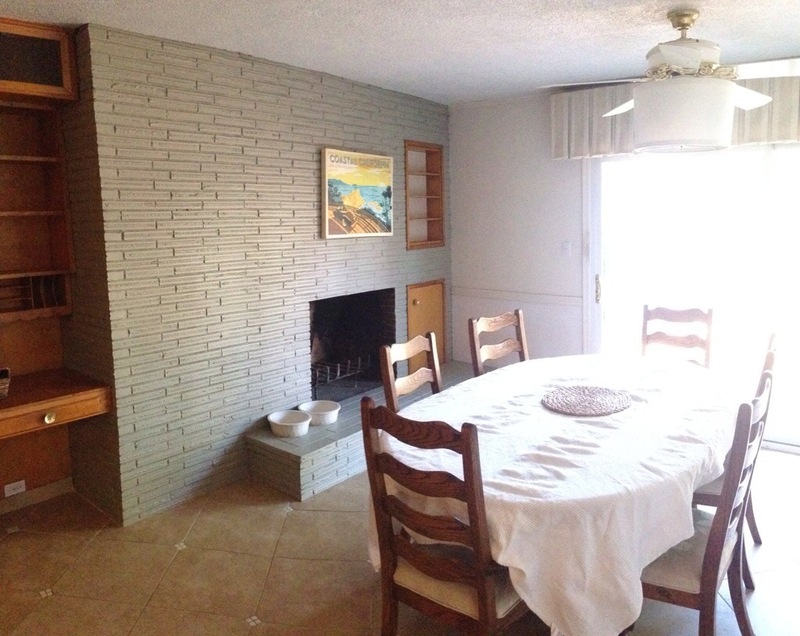 It also doesn’t help with the ugliness, that this is the only room in the house with remnants of popcorn ceiling (albeit shaved off and painted). We also have a love-hate relationship with the original midcentury, tweed half- drapes (behind the fan) but that’s another story for another time. 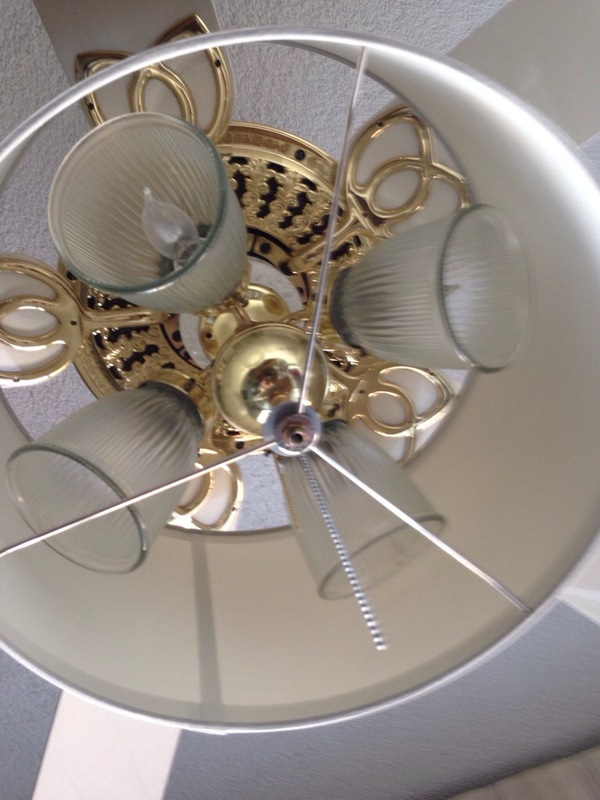 However the fan is a high quality, Casablanca. Quiet, multiple speeds and fabulous light. Not bad for an 80’s throwback? Yet the fan needed an update. During our two weekends of marathon painting I finally grew tired of looking at it. Grabbing a drum shade from another light in the house and extra extenders I gave it the ol’ college try. We used the same technique as our last, except we were able to use a smaller extender. 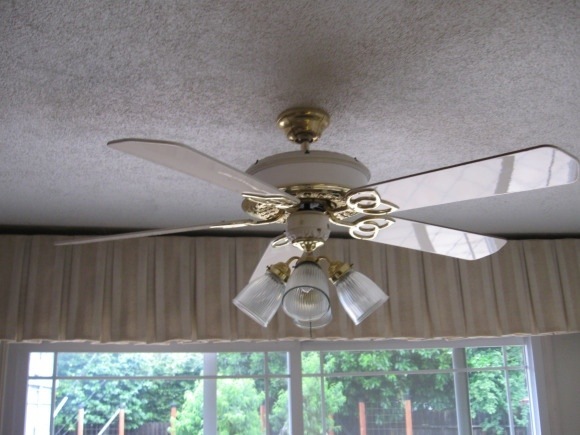 Yet altered our technique by adding a large washer between the shade and connectors in order to stabilize the shade. We also did not add extra chain and threaded the main chain through the middle of the shade. This allowed for a cleaner look. Such an improvement! It’s almost pretty! 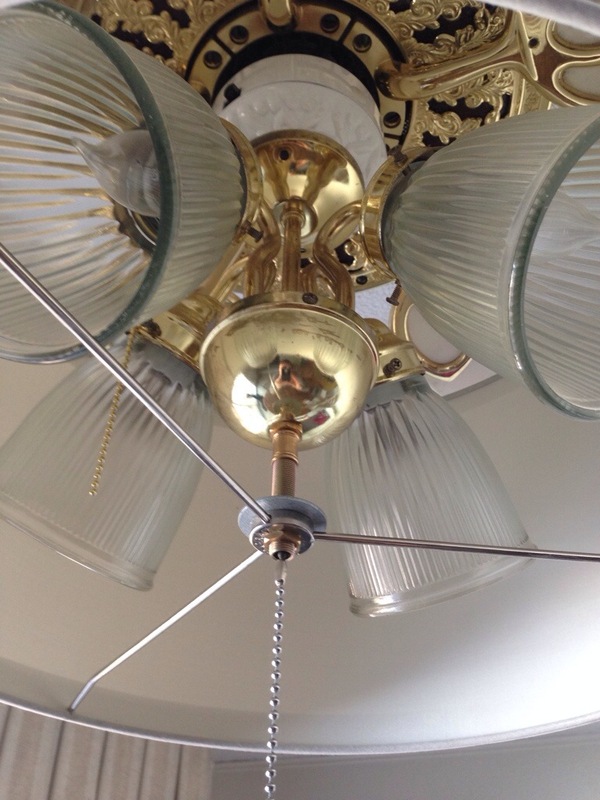 We actually are warming up to the cream colored fan blades and hint of gold brass. Originally we had the notion to paint the whole thing oil rubbed bronze, but the dark color would’ve drawn the eye towards ugly ceilings. 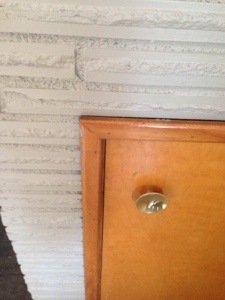 Also brass is starting to make a come back, and the fan ties in well to our mid century gold knobs in our built ins. Now the light is complementary and blends well with the room. Who would’ve thought bringing a kitchen back to a neutral color pallet has been more work than expected. At least this was one easy and cheap update. Back to painting…Happy Sunday everyone! 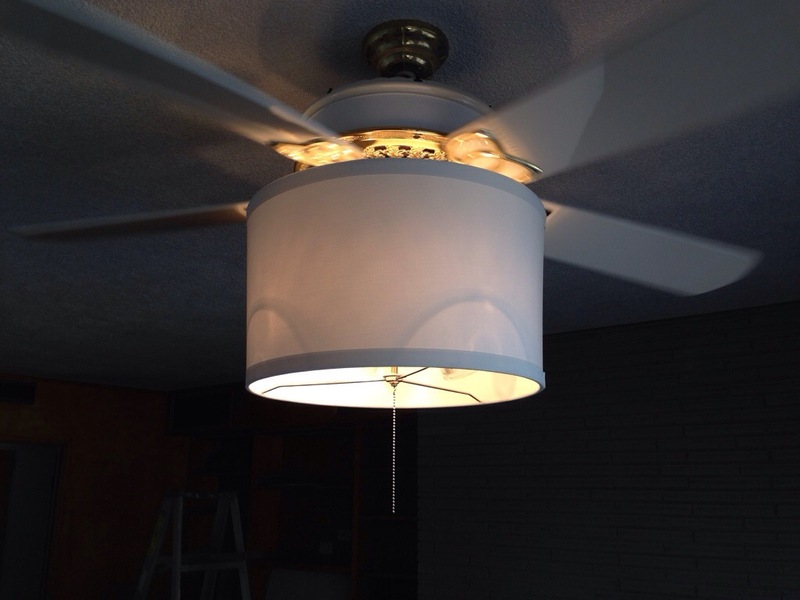 This entry was posted in Projects and tagged add drum shade to ceiling fan, Ceiling fan, cheap, easy, ugly ceiling fan, update by Tandra. Bookmark the permalink. So cute! 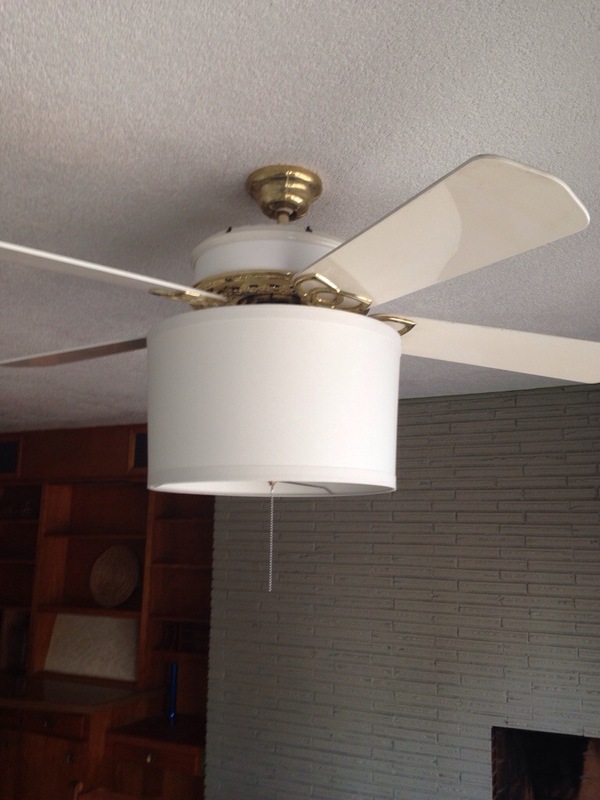 I was thinking I want to take our master bedroom fan out, but maybe there is a way I can accentuate it like this.